Yes, there's still time to finalize everything! Don't give in to anxiety. We're here to help. Start by looking over these 10 easy recipes from the Boston Globe. Heed these words of wisdom from Sheryl Julian in Wednesday's Boston Globe Food Section where you will find some terrific recipes to drool over. "Thanksgiving is so hard on the hosts, some of it self-imposed. You want to set out a grand feast and give everyone an afternoon to remember. But that doesn’t mean pulling out every recipe your mother ever made for the holiday and generally overdoing it. Prepare a nice dinner and don’t worry about sending guests home with doggie bags." So give yourself a break. Enjoy your holiday. If there's something special someone wants, maybe, just maybe they can make it and contribute it to the family table. Despite, and perhaps because of, these chaotic times we're living in now, we should all take more than a moment to count our blessings. Thank you for reading. And Happy Thanksgiving 2017! 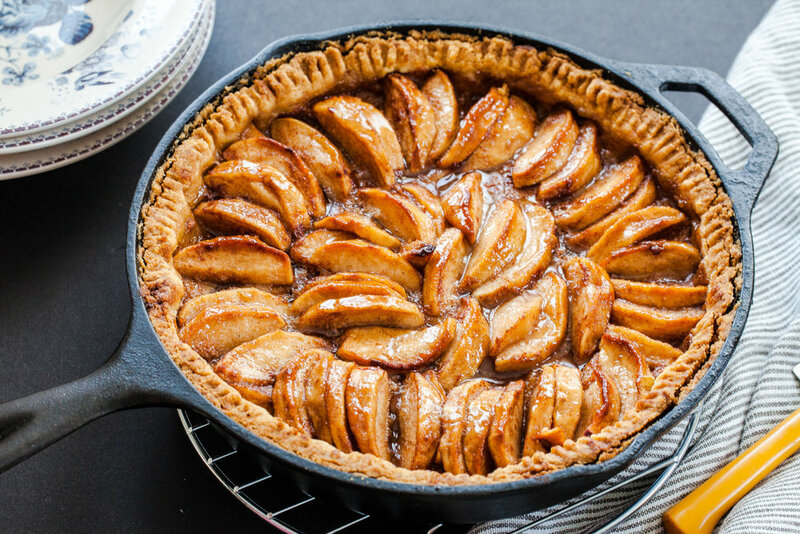 Skillet apple pie with press in crust. Easiest ever apple pie for sure. Pecan pie bars! Just like the pie, but make 12 in a baking dish, press-in dough.